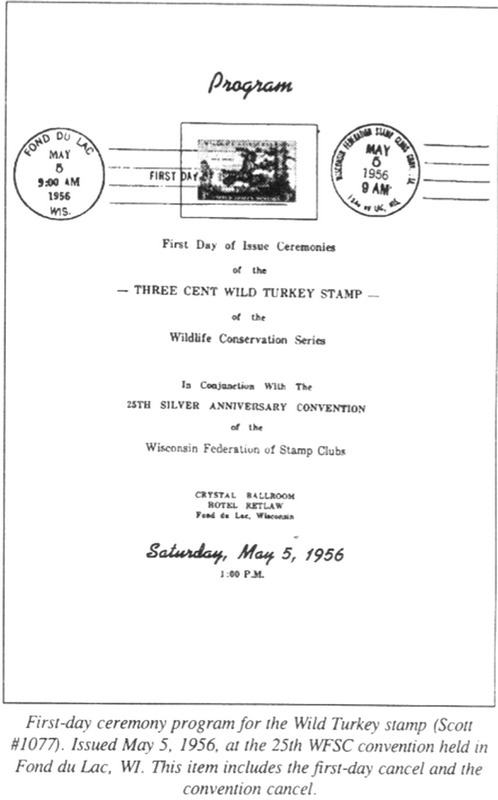 This page includes The WFSC First Day Cover Collecting: Spotlighted or in Passing columns from the 1997 issue of Across the Fence Post. In previous articles, I have mentioned a few FDC collecting subspecialties with some description. The subject of first-day ceremony programs, however, has enough idiosyncrasies to warrant an independent discussion. Even though the majority of first-day ceremonies occur within the coastal states, we have had enough of these events in Wisconsin to be able to construct a sizable collection of free ceremony programs. By my calculations, 14 first days have been held in Wisconsin since 1971. The 1980s was the most productive decade with nine first days. Thus, it is possible to have as many as 18 programs if all Wisconsin first days were attended from May 29, 1948 (when Scott #957 was released) through June 25, 1993 (when Scott #2489 was issued). Actually, Wisconsin hosted 19 first days during that period, but the U.S. Postal Service did not distribute a first-day ceremony program for the Lombardi Trophy Hologram envelope (Scott #U618) released in Green Bay in 1990. No official reason has ever been given as to why the customary program was omitted. Rumor has it that the Postal Service's selection of a first-day city for this issue was on the spur of the moment, and there was not enough lead-time to produce a program. Now that I've discussed the most obvious manner of acquiring first-day ceremony programs, let's consider that they can also be obtained from dealers. As with many philatelic specialty items, there are dealers who sell first-day programs exclusively. I'm aware of six such dealers who do business mainly through mail order. It is also quite possible to find dealers at various bourses that carry general United States material and may have an abbreviated stock of programs. First-day programs can cost as much as $100 or more, but the majority are marketed at prices ranging between $5and $25. Unfortunately, the U.S. Postal Service Philatelic Fulfillment Service Center in Kansas City, MO, recently halted sale of first-day programs. Nevertheless, it is possible to still obtain recent first-day programs if you are a member of the American Ceremony Program Society. An itemized list of its program stock appears in their publication titled The Ceremonial. This newsletter, in magazine format, is published bimonthly. Their prices are very much in line with the economical prices formerly charged by the Postal Service's Kansas City facility. There are a variety of program types. First, there is the official first-day ceremony program, which is issued by the USPS. It includes a listing of the actual program speakers, presenters, bands, singers, color guard, and clergy who participated. It also contains an attached sample of the postal item being issued as well as the official first-day cancel. The next type is a souvenir program, which may or may not be issued by the USPS. It is only a notice that a postal item was issued (type, when and where) and does not include the ceremony agenda. Additionally, it is usually up to the collector to attach the postal item to the program and have it canceled. The third type is classified as an event program. This is issued if the first day is part of a larger event. Event programs not only include the agenda of the first-day ceremony, but also the schedule of happenings pertaining to the parent event. Some philatelists like to collect second-day programs. When a postal item is issued, there may be a ceremony held the next day at a location other than the first-day site, but at a site related to the commemoration of the item issued. To illustrate, when the Lighthouses booklet was issued on April 26, 1990, the official first day was held in Washington D.C. A second-day ceremony was then held at Rancho Palos Verdes, CA, to honor the Point Vicente Lighthouse, which is still in service, though now fully automated. As philatelists we are preservationists. That is, preservation and storage of our various collections is always paramount in our minds. Most of us have had storage and preservation problems at one time or other, ranging from a simple lack of space to the more complex of preventing deterioration. While I wish to focus primarily on the preservation of covers, much can be applied to any item that is chiefly composed of paper. It is quite true that covers are more durable than stamps, but they still need about the same amount of care. The most common enemies of paper are paper itself, moisture, sunlight, improper storage and handling, and insects and rodents. A chemical engineer told me that paper is its own worse enemy. Much of the paper we use daily is quite acidic. As a result, most paper has a life span of 75-100 years before it becomes brittle, discolored, and practically turns to dust. Keeping this in mind, we all know there are many historical documents in public libraries, as well as private collections that have outlived this projected life span and remain relatively intact. There is little the common person can do about the acidity of papers. However, if you intend to produce your own cachets, you might try using envelopes that have at least 25 percent cotton fibers. Such paper tends to hold up better than the usual sulfide envelope and is much more resistant to toning (yellowing). Moisture is a big problem. Storing collections in attics or basements, therefore, is not a good idea. In case of a leaky roof, the first place that will get wet is the attic. Attic vents are far from weatherproof and can let in rain and snow. Basements can become damp in the summer and they tend to flood from surface water, sewer backups, and the like. If you must use your basement for storage, try to control the humidity with a dehumidifier and keep your collection 2 1/2 to three feet from the floor. Install a water alarm near your floor drain and/ or near your sump pump pit. Never store your collection in a fireproof safe, as this type of safe depends on water or steam to preserve its contents. The environment, therefore, is very damp. A fireproof safe has a moist clay-like material between the walls that when heated, builds up steam and blows out through wall plugs allowing the contents of the safe to become wet. If your collection is stored in a cabinet, it is a good idea to place one or more silica gel moisture-absorbing packs within the storage area. These packs are also used in gun cabinets and can be purchased at sporting goods stores. Directions for use are printed on the packs. Always try to prevent your storage environment from exceeding a humidity level of 50 percent. Covers are best stored in an upright position in albums that are acid free and with stiffeners inside each cover that are also acid free. Thus, using inserts and cover and album page protectors that are composed of Mylar D is the ultimate way to go. An alternative for inserts is to use acid-free paper containing at least 25 percent cotton fibers. Some authorities say covers should never be bound with rubber bands. However, if you choose to commit this sin, make sure the rubber band is never in contact with the covers for more than a few days total. Rubber causes paper to deteriorate more rapidly and covers can become permanently malformed. Handle all your items as little as possible and use tongs or wear latex gloves. Covers should never be placed in any type of light - natural or artificial - for extended periods. Ultraviolet and infrared rays can be very harmful. Not only does light bleach the inks, but also it tones the paper giving it a tan to a light-brown color. Prolonged light exposure also sets up a chemical reaction in the paper that will eventually lead to almost complete destruction. If you intend to exhibit your collection, take care that the pages will not be exposed to direct sunlight or any other type of light for more than a few days at a time. If an insect or rodent infestation should occur, remove your collection from the storage area before using any type of aerosol or smoke control. If removal is impossible, use lethal ' baits or traps that do not emit vapors. It is always a good idea to inspect your entire collection periodically to ensure there has not been any destruction through an infestation or by any of the other enemies of paper. This is only a brief synopsis of the volumes that have been written on the subject of preservation. Perhaps the best way to summarize is to remember that paper survives best in the same type of environment that people find comfort-able. Need I say more? If you are an active first-day cover collector, I emphatically suggest that you try cachet making. I've been doing an occasional cachet since the 1977 United States Christmas issues (Scott Nos. 1729 and 1730), and each time it's been an experience that has given me a rush like no other in my many years of philately. It has brought me national and international notoriety, but on a rather restricted scale, of course. I cannot say that cachet making will do the same for you or that it will put any dollars in your pocket. Cachet making has changed somewhat since I got started. At that time, there were very few amateurs, but within the last 20 years, many have entered the field. There is, however, always room for more. If you are into trading for items for your collection, you'll find your own cachets to be excellent material for such transactions. Also, sending your cachets to philatelic friends without requesting payment often reaps great items. At the very least, it will bring interesting material to add to your trading stock. Of course, there is a monetary investment in cachet production that often will not be returned. It helps to create cachets in only one color and to limit your run to about 100 covers. Getting back to some of the notoriety I have received, it's been in the form of my cachets appearing in Scott's First Day Cover Catalogue, Aloha RR'ing, AFA News-Jack Knight Air Log, and Richard Schoemaker's American Bicentennial Covers, Cachets, Cards & So Forth. I have also been written up in First Days, the official journal of the American First Day Cover Society. My first cacheted FDC appeared in Mike Malone's 1982 Cover Lovers' National Auction with an estimated value of $10 and sold for $8. I had donated most of those 1977 covers to a First Day Cover Collectors of Wisconsin fund-raiser, for which they were offered for sale at $1 each. Thus, this particular cover increased in value seven times in just five years. I must say that each time I receive public notice; I'm elated to a level just short of admission to a psychiatric facility. Are my cachets works of art? Not on your life. A critic once described my output to be a half step up from junk, and sometimes even junk. Even so, my advice is to give cachet-making a shot. Don't care what others might say about your work, trade with friends, and let me know when you have something in stock. I predict you will have lots of fun and make many new friends. In my next article, I'll discuss materials used for amateur cachet making and how to deal with copyright issues. So you want to create a cachet, but you lack artistic skills. No problem. The list of available existing artwork for cachet making is endless. Dover Press, for instance, has published many booklets containing copyright-free art. Although the Dover artwork is specifically intended for composing commercial newspaper ads, these ready-made illustrations often also lend themselves to cachets quite well. Other existing artwork would include photographs, commercial labels, stickers, etc., and even mint or canceled stamps. All that's needed is your own added captions. Further more, as you trade with other collectors and/or amateur cachet makers, you will be exposed to an abundance of novel cachet ideas. In all instances, however, the cachet maker must be careful not to infringe upon copyright laws. If copyrighted material is used and you can demonstrate you are not selling your material or making a profit, it is possible you may not be troubled by the copyright holder. Since this is a risky approach, though, it's advisable to use public domain illustrations whenever possible. Dealing with copyrighted stamp subjects can pose another problem. The solution to getting around this dilemma without paying a licensing fee is to create a cachet that lists facts about the stamp subject, while ensuring the subject's name, title, or image is not included. Franking the cover with the related stamp is illustration enough. 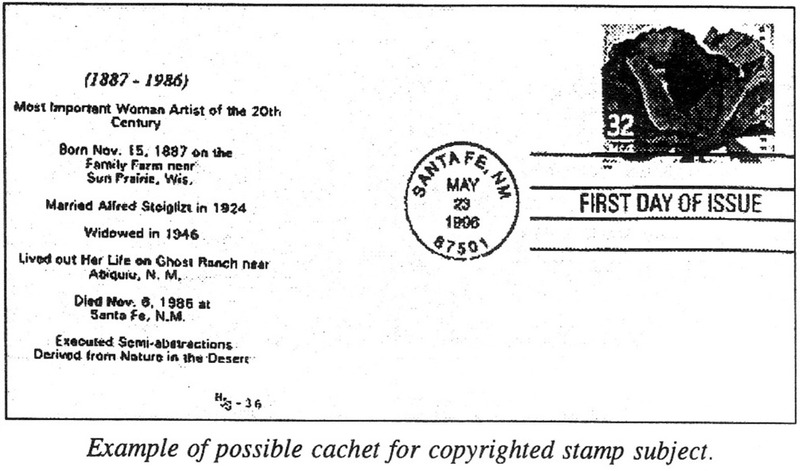 An example is the cachet I produced for the Georgia O'Keeffe stamp (U.S. Scott #3069). The amateur cachet maker must also consider the quality of envelopes used for the project. I advise using a stock that contains 25 percent cotton fiber, as regular sulfide envelopes have been known to virtually self-destruct in as little as 25 years. The 25 percent cotton composition makes the cover more durable, resistant to yellowing, and gives a whiter background for the cachet. Of course, colored envelopes can be used, too, but I cannot evaluate their longevity because I have had practically no experience with them. Be forewarned that envelopes watermarked or labeled, as "Bond" is no guarantee that the product contains cotton fiber. The only proof of cotton content is a "25 % cotton" watermark. I do not recommend using 100 percent cotton fiber envelopes because they do not take certain inks very well. Another word of caution: When furnishing your own envelope stock, be sure to notify your printer that the paper contains 25 percent cotton fiber. Naturally, you'll also want to remember to request this composition when using printer stock. This is what I have to say. What do you have to say?